Dalrymple Farm: 1870s crew and house. 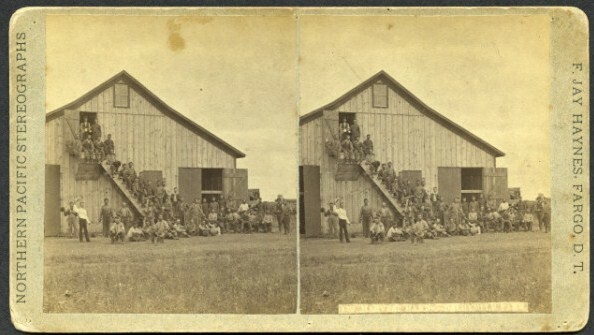 Twenty-six men, two women, and one child in front of a one and a half story, wood frame house. Agriculture, work life on a typical Bonanza Farm. One of the most widely known bonanza farmers in the area during the late 1800s was Oliver Dalrymple, who owned his land and also managed other large-scale farms in the area. He is known as one of the most successful wheat farm growers of the area. He established the first large-scale farm in the Red River Valley and was highly successful. When Dalrymple moved to North Dakota with his family, there was no available housing. His family survived in makeshift housing, and he eventually built a wood frame house. After Dalrymple was financially stable and ready to permanently settle in the area, he built another wood frame house. “Various additions of dubious architectural value” were added to the sturdy wooden frame house over the years. Accessible water was one of Dalrymple’s goals for the rural house. He sunk 30-foot wells around the house and drinking water was available. The Dalrymple household relied on rainwater barrels and coulees for water supply in the wetter seasons. 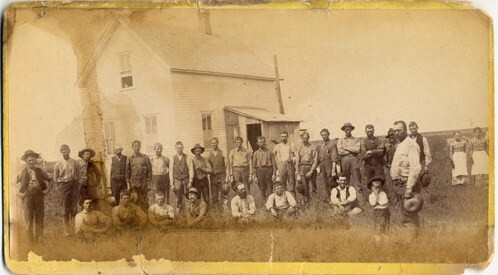 Group of field workers posing for this picture in front of a barn at the Dalrymple Farm. In the photograph, a harvest group is shown in front of a wooden barn at Dalrymple farm in the late 1800s. The hired help stayed in barracks, but these would often be overrun with bedbugs. Often a better choice for the men was often to bunk in the barns. Dalrymple had at least three managers plus himself to run his bonanza farm business successfully. His success even brought him a visit from President Rutherford B. Hayes in 1879 during one of the finest harvests. 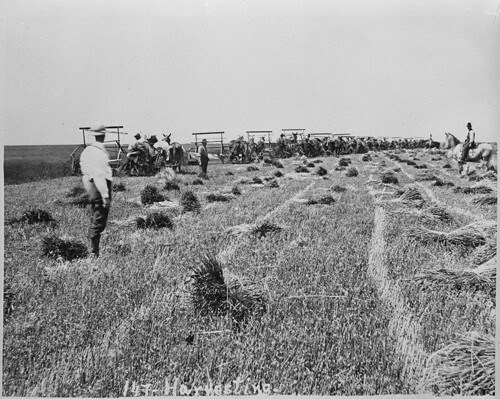 More than twelve self-binder harvesting machines each pulled by four horses at the Dalrymple bonanza farm in the 1877 harvest. Bundles of wheat lay in field behind the horse-drawn binders. Two men standing to left side of print, and another on horseback watching. Dalrymple, John Stewart. Oliver Dalrymple, Bonanza Farmer , Minneapolis 1960, p.24.